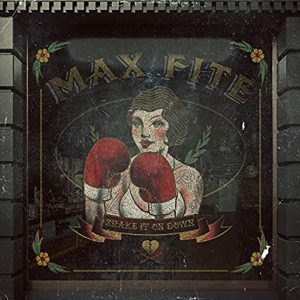 Los Angeles indie rockers Max Fite has released their new album Shake It On Down. Opening with the thick guitar concoction of the title track, Max Fitelson’s limited vocals push atop the straight-ahead beat from drummer Macy Lucarelli. “Devil In Me” follows with a main riff keeping this slightly slower second tune together. Jamie Cunningham has this one well in hand with his guitar playing throughout and a really creative, quick lead mid-way. “Court Jester” might be the best rocker here with its slide opener, a cool, different sounding vocal and Carl Raether’s bass and Cunningham locked in for a perfect plodding. The lead here absolutely smokes and the sped-up ending is perfect noise! There is even more wailing opening “Yes Man,” then we are into a tight, kinetic guitar flicking behind an almost spoken vocal. Lucarelli’s really spinning on the snare here and the excellent backing vocals of the band finally come into play. “Time to Heal” ends the album. With its mid-tempo snare snapping, rather clean guitar sounds, and heartfelt lyrics about someone who’s “gone away,” Fitelson’s vocals over the top of it all is the softest it gets on this collection. Probably my favorite tune on which we get some simple yet effective Raether bass and a nice sway overall, showing that Max Fite can tackle something slower and softer when they want to, which I would have wished they had done maybe another time here in the midst of all the heaviness. Solid stuff here from Max Fite on Shake It On Down.